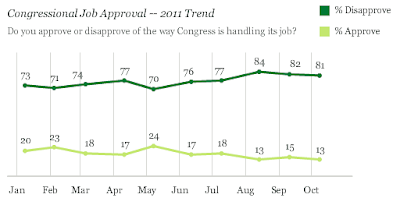 The percentage of Americans who approve of the job Congress is doing returned to 13% in October, matching the all-time Gallup low on this measure, first recorded in December 2010 and repeated in August. Clearly people are unhappy, and it's primarily about jobs. Secondarily it's about Congressional bickering and not getting anything done about the deficit (or anything else). There have been no structural reforms and no desperately needed repeal of Davis-Bacon. No legislators brought right-to-work laws as a bargaining chip in the budget negotiations. Lobbyists effectively write our legislation. The bank reforms that did pass have been both toothless and useless. Congressional compromise amounts to spending more on the military in return for spending more on social programs. Economically we can afford neither. Factor into the picture a jobless non-recovery with real wages falling, and the Congressional approval rating is both easy to understand and well deserved.